Bring better seeds, crops, livestock and aquatic organisms to market faster by simplifying genomic data capture and analysis while saving 44% on your analysis costs. 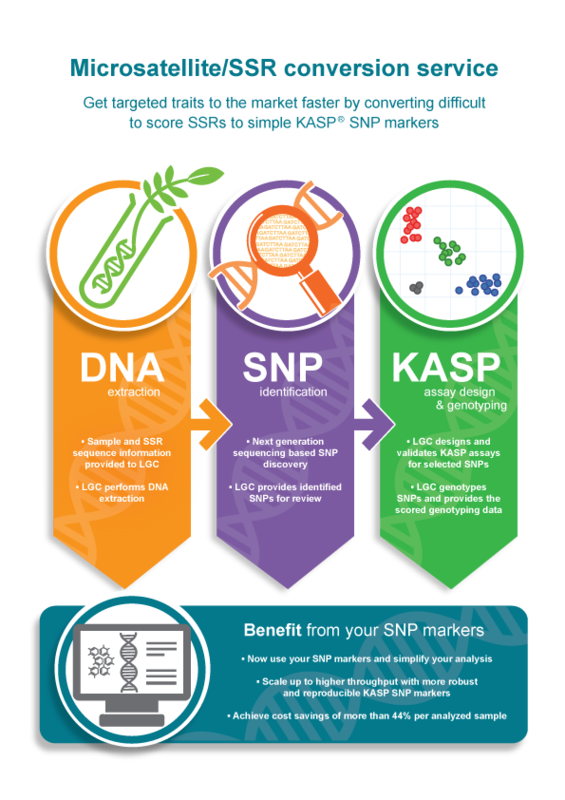 The new service combines our proprietary DNA extraction technology with state of the art NGS techniques, KASP assay design and genotyping into a convenient service for converting microsatellite markers (SSRs or STRs) into robust and cost efficient KASP SNP markers. 1E. Guichoux et al. Current trends in microsatellite genotyping. Molecular Ecology Resources (2011) 11, 591–61. Based on 24 SSRs analysed in 500 samples vs. LGC all-inclusive pricing (incl. DNA extraction and design). Pricing starts at £366 / $549 / €494 per SSR dependent on the number of SSRs submitted for conversion. Pricing and conditions may vary dependent on the technical requirements for specific organisms. Please enquire for the most cost effective options for your project. Please be aware, the presence of SNPs in SSRs or their flanking regions is a biological event that is likely but not certain. If no SNPs are present your KASP assay design and genotyping costs will be refunded. Identified SNPs cannot be guaranteed by LGC to be associated to the same function as the SSR because biological information of the organism is required. A functional validation study based on meta-data, mapping population or field trial is recommended. Please note, this is not included in the SSR marker conversion service package. Terms additional to our standard terms and conditions apply. Please see the SSR conversion service additional terms PDF.